Revenge: Is there any interest in an Amir Khan vs Breidis Prescott II here in 2018? As fight fans have read, Amir Khan is back in business, having signed what he hopes will prove to be a hugely successful three-fight deal with one-time “enemy” Eddie Hearn. Khan will be fighting in Liverpool on April 21st, but his dance partner will not be revealed until next week some time. All we have to go on is Hearn stating how the opponent will not be any kind of a pushover. We simply don’t know how much Khan has left or how his chin will serve him if, or when, he is tagged in his comeback fight; and it is possible the comeback could meet a disastrous end after just one of the planned three fights. But that’s part of the attraction in a big way with Khan: the fact that he provides ‘don’t blink’ entertainment. As fast and as skilled as he is, Khan is seemingly always just one punch away from being wrecked. And it was Colombian banger Breidis Prescott who seemed to have burst the Khan bubble way back in 2008, when the unknown puncher scored a win that at the time convinced many Khan would never bounce back. But Khan has proven, time and again, how he is nothing if not resilient. Here he is again, attempting to return to glory on the back of a nasty (and almost two year old) KO. And there is a slight chance Khan might face Prescott in fight-one of his latest comeback. 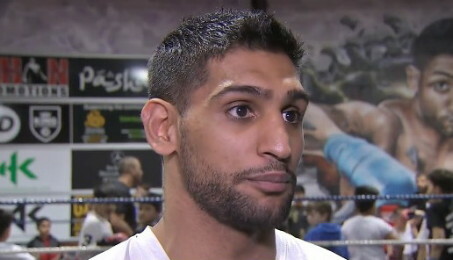 “Imagine bringing the likes of Prescott, [Danny] Garcia and [Lamont] Peterson to the UK and having those big fights,” Khan said to Sky Sports during the media event that was the announcing of his deal with the Matchroom stable. It’s curious that Khan brought up Prescott’s name. It was ten years ago this year (September 6) when Prescott scored that stunning, potentially career-ruining 54-second stoppage win, and there was, for a long time, talk of a possible rematch. It never happened, but maybe it still could – this April? Khan has suffered four career defeats at pro level and he has never avenged any of them. We can forget all about a revenge mission against Canelo Alvarez, but just maybe Khan will look to wipe off a couple of his defeats as he works his way towards what Hearn says will be a “Super Fight” later on this year. Would there be sufficient fan interest in a Khan-Prescott II here in 2018, enough for Hearn to be able to sell out The Echo Arena in April? Prescott never went on to score anything as notable as his win over Khan and the 34 year old has lost his last three fights (all to good opposition). Prescott, 30-11(22) has been stopped a couple of times and he last scored a win in October of 2016. But, despite all this, would YOU still have some interest in seeing Prescott travel over to the UK for a second fight against the man he made his name against? As Khan’s first fight back under the new deal, this one would fly. Most likely. Khan remains a big draw in the UK and he is as we know, always exciting. Even at this late stage in his career, Prescott would be dangerous and Khan would have the chance to eradicate his first pro loss. We’re not talking Box Office or Pay-Per-View, obviously, but as a ‘regular,’ or ‘free’ TV fight, this one would generate quite an audience. The curiosity factor alone would see to that. Can Khan finally remove a thorn from his side, even if it is one that doesn’t sting as much as it once did? You are here: Home / Boxing News / Revenge: Is there any interest in an Amir Khan vs Breidis Prescott II here in 2018?